DO-91210-45 was succesfully added to your cart. Usually ships in 13 days. The Workhorse thermometer provides the user with a display that is easy to read in all types of lighting, and long battery life (150 to 200 continuous hours) making it an excellent choice for as a basic meter. This meter has adjustable offset allowing the user to adjust the thermometer exactly to a specific temperature, in-house calibration, or particular sensor for increased accuracy. Workhorse features a Hold button, F/C selectable units, and auto power-off. Accepts every type K thermocouple probe with miniconnector. NIST-traceable certificate, one type K probe (5”L x 1/8” dia. tip), bench stand, carrying case, and one 9 V battery. Measuring Temperature Accurately: What Are the Costs? What is the calibrated accuracy of the unit (tolerance used on the NIST traceable certificate)? In my application, the wire connecting the probe to the handheld unit must withstand 80-100 degrees C (the usual plastic wire melts). What accessory is suggested? 08512-82 has fiberglass insulation for up to 482C. This unit has auto shutoff, can this feature be override, or turned off ? and where is this unit manufactured ? and how reliable is it ? This item does have a auto shutoff that cannot be "turned off". The origin of this item is China. This is a good low cost thermocouple thermometer. I recommend looking at the reviews from other customers. The cable length is 40". What is the weight of the thermometer? The shipping weight of the thermometer would be 0.7lbs. Can I use this thermometer in our warehouse and refrigerator to record daily temperature? This thermometer will Type "K" air/gas probes which are required for the measurement of air temperature in open areas. The description of this product says it comes with a NIST-traceable certificate. Does this mean the product ships from the factory pre-calibrated? I'm looking for a unit that is pre-calibrated, so I can begin using right away, and then begin follow-up calibrations on an annual basis thereafter. Yes, that is correct. This unit comes with a NIST traceable certificate from the factory. Additional NIST calibration is not needed at the time of order, but can be sent into us for calibration at the needed schedule afterward. Would this probe and wire be water proof? The metal portion of the probe is waterproof - however it is not waterproof past that point. I wish to measure temperature of wort in beer making. Would this probe do the job? Yes, this unit would be fine for brewing beer or other kitchen tasks. The unit is able to be field calibrated and will accept any type-K thermocouple with a mini-connector; making it easy to switch from monitoring mash temperatures to a thinner, wire-type immersion probe to check fermentation temperatures. Would the included probe withstand 300°C, molten solder pot measurements? Yes, the maximum temperature for this sensor is 932 °F (500 °C), with short term usage to 1292 °F (700 °C). I use this product in a manufacturing facility to double check the internal temperatues in one of our production vessels. Works like a charm. This thermometer lives up to its name as a 'workhorse'. It's durable, accurate and easy to use, and the price is competitive. I definitely recommend. The calibration adjustment is difficult to use and the unit must be recalibrated each time it is used. I used this to brew my own beer at home. It works great, but I did see that the probe might not be long enough for this so I also purchased a longer probe 93756-20 which fits perfectly. Its a great price and does its job. It would be nice just to purchase the workhorse without probes, but still very happy with it! 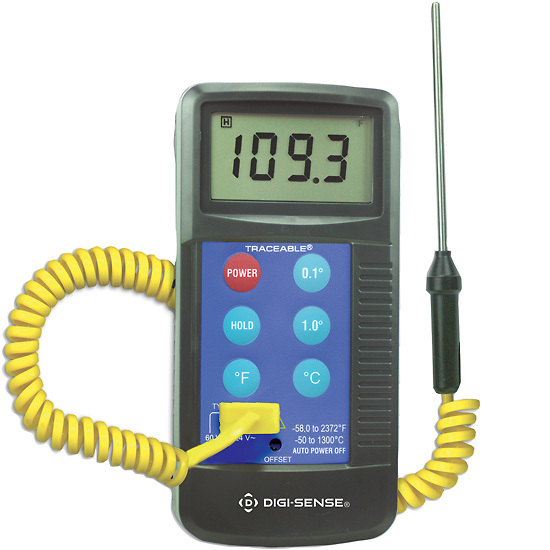 Use to measure refrigerant lines and environmental temps. Worked with Cole-Parmer products when I worked in aerospace many years ago. They are very well priced for what you get. I don't believe you can do better. I purchased two Workhorse thermometers and in a short time and with very limited use both have stopped working. The connector plugging into the front of the unit also makes it awkward to use.